This is a rather unusual pop-up book because it has virtually no color, just white light card stock revealing a sort of landscape with flowers, shrubs, trees, animals and on the last page a lily pond, made out of mirror paper. I wouldn't class it as a straightforward book for children more like something to share with adults and children. There are only five spreads but the open up to very clever paper engineering and you wonder how they all fold flat. The last spread, with the lily does have a bit of color, some green leaves on the underside of white leaves with a snail in them, the green is only viewable as a reflection in the pond. Also on this spread there is a dragon fly with wings made of plastic and two three-dimensional flowers that don't fold up but fit into the lily pond recess. There is a hands-on element as well, David Pelham has written a poem which is accessed by turning a notched wheel on each page which reveals the poem in a curved cut-out section. Despite the almost complete absence of color I've always enjoyed looking through Trail to admire the sheer cleverness of the intricate pop-ups. Most movie-goers probably don't realise how realistic the future looks in sci-fi entertainment. Set and production designers create a very plausible feel and look for years to come with buildings, props, fashion, lighting and of course type, whether it's those huge numbers on the USS Enterprise in 'Star Trek' or the text on a tablet's screen in 'Moon' Dave Addey explores this rather niche corner of sci-fi in his surprisingly interesting book. The all-time fave futures type is Eurostyle Bold Extended designed in 1962 by Aldo Novarese for the Italian Nebiolo type foundry and even though it's over fifty years old it still looks the part and can still be used to project a future feel. This was the typeface that Addey kept coming across in movies and inspired him to find out more and eventually write this book. Seven films are looked at in detail: 2001; Alien; Star Trek: The motion picture; Blade Runner; Total Recall; Wall-E; Moon. The typefaces in all of these are explored with plenty of stills and text revealing how they are used right down to the smallest bit of copy, for example, page thirty-six has a still from 2001 showing Doctor Floyd reading the long instructions on how to use the zero-gravity toilet and it's printed out on page thirty-seven so you can read them. The long running Star Trek used several faces that were issued as a font pack in 1992 (still available online). In Total Recall, on page 170, there's a logo from Mars Today based on the USA Today newspaper. As well as the films there are heavily illustrated Q an A interviews with two typographers Stephen Coles and Antonio Cavedoni, director Paul Verhoeven, animators Ralph Eggleston and Craig Foster and designer Mike Okuda. The last few pages have fascinating visual summary of how hard it is to create a credible future look that's also good entertainment. 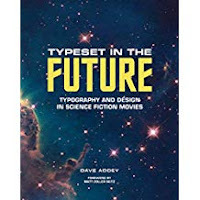 Dave Addey writes in a pleasing breezy style and the rather flamboyant look of the pages makes the book a fun read that will interest graphic designers and especially sci-fi movie fans. Charles-Joseph Minard wasn't the first data graphics designer to utilise flow maps, on page eight there is what's considered the first, an 1837 map showing railway traffic in Ireland designed by Henry Harness. 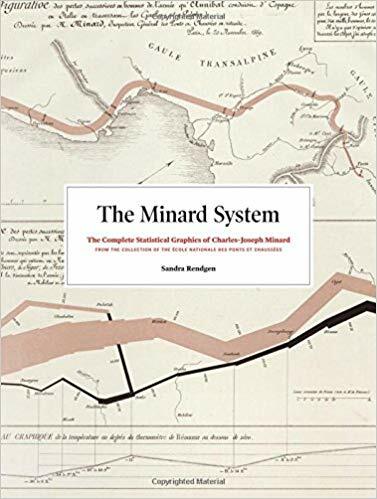 Minard (1781-1870) is usually considered to be the person who really developed the flow map and chart idea in the eighteenth century and this fascinating book has the complete collection of his statistical graphics: sixty-one in all. Minard was alive during a huge change in technology with the expansion of rail and maritime transport, the telegraph and other machines that were changing peoples lives in Europe. Industry produces statistics and Minard, though trained as an engineer, thought this sort of data would be better understood in a visual format. The book has plenty of maps (all in color) that show how he developed his flow ideas and intriguingly how data dictated the geography of Europe in his work. For example, map forty-one about the export of coal from England in 1860 has a flow width so large that the English Channel is far wider than reality. This is because, on the original printed map, one millimetre represented five thousand tonnes. All the flow maps in the book have information presented in this tight, precise style. One really nice feature in the book are several sequential series of maps, pages fifty-three to sixty-one has maps showing the transport of fuel in France from 1845 to 1860 using six maps (plus two enlargements to study the detail) and they clearly show how Minard interpreted the increase in fuel transport. Though nothing to do with Minard there are some odd data details here and there throughout the pages. Great ports of the globe from 1861 has proportional circles scaled to the amount of tonnage in each port. Liverpool, London and Constantinople handled the most but tiny Saint Helena (where Napoleon was exiled) in the south Atlantic and incredibly remote handled more tonnage than Baltimore or Halifax in Canada. The book is beautifully produced from Minard's originals held by the Ecole Nationale des Ponts et Chaussees in Paris and though all the work is in French the panels of text on the maps and charts have all been translated and the author has written lengthy captions to each illustration. Needless to say there is a reproduction, over a spread, of Napoleon's disastrous 1812-13 Russian campaign. 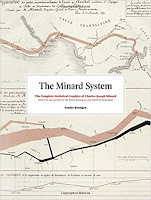 Information designers and the general reader will find The Minard system a worthwhile visual treat. This is the page from McCall's magazine that featured the sundae glass. I bought this in the early sixties and it's still a book I would recommend to anyone who wants learn about typographic finesse. Aaron Burns was the boss of the Composing Room, during the fifties and into the sixties. It was New York's leading typesetting house for the graphic arts trade. I think it's worth saying that the contents reflect machine and hand-setting type, long before the computer but the fundamentals revealed in these pages are now just a few keystrokes away for anyone with a pc and the appropriate software. The pages are divided into three sections. First a selection of type shown mostly as display setting for ads and editorial. Second an analysis of the pages in the first section showing the changes designers made to achieve the perfect setting. Third fundamentals covering spacing, alignment, punctuation, underscores, text setting, ragged lines, initials, combining faces, leading. This is a large book (fourteen by ten inches) and the 112 pages have plenty of examples of beautiful display typography whether it's some setting for an ad, editorial page or an order form for a chemical company. Aaron Burns ended his introduction like this: Careful, constant, painstaking care and attention to every detail is necessary to achieve 'perfect' typography. Although the effort is great -- the reward is greater still for those who care! *The only contemporary book I've seen that has much of Burns thoughts on typography is The complete manual of typography by James Felice and published by Adobe.